This blog tracks my running plans and thoughts and provides a place to remember past running adventures. Chippewa is just a week away so I figured I would take my normal peak ahead at the weather forecast, looks much better than last year (if the forecast accuracy follows normal trends it will change fairly often between now and then but I like watching them anyway). Now that I have the forecast, what do I plan to wear? Clothing is not the issue, for me its which shoes? If I wear my Continental Divides I know I will lose toenails, if I wear my Rucky Chucks I may have some blister issues based on recent runs, if I wear my Mercury's I will have foot pain so what to do? My CD's and Merc's are also fairly well worn out so that is another dynamic to consider. 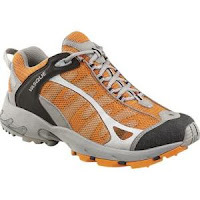 So, I ordered another pair of Vasque Velocity's (from BackCountryOutlet) which I had good luck with last year. I will run today and tomorrow in them to make sure no blister issues or other problems surface and then I will bring them all with me and make the call the morning of the race. I have to admit that part of the reason I bought these is as an emergency option for Chippewa but the other reason is they were $49.95 and I am a sucker for low cost shoes. I should also note that the orange shoes are a bit out of character as well but then again as I told my daughter, I buy shoes for functionality, cost and last style. These fit 2 out of 3 and who knows maybe the orange color will grow on me and if nothing else maybe they will help hunters figure out that I am not a wounded deer hobbling my way through the woods. What are my fueling plans, good question? Fueling will be Clif Shot Electrolyte in my Nathan, supplemented with Clif Shot Bloks, Stingers and I do plan on sampling the food at the aid stations. Last year I took in soup and Coke and both really hit the spot. This year I will try to sample either the PB & J or the Grilled Cheese as if I do my 50 later in the year I may need foods like this. My thinking is that if they sound good I will try them, if not, I won't as I don't want stomach issues at Chippewa. What are my race day plans, great question? I am still pretty unsure of my conditioning for this race, the failure at my last long run didn't exactly help the planning. Last year in the snow I ran 8+ hours, this year my goal is to just come in under 7 1/2 hours or at least set my 50k PR which would be under 7 hours and 40 minutes. I would love to do better but the truth is I don't know what I am capable of nor do I know this course very well since last year was my first time on it and I would like to think that the conditions this year will be markedly different. Last year the snow was an experience, not sure what the trail conditions will be like this year (I am counting on not having snow) or what other variables will exist so I think I will shoot to take it easy and see how things work out. I do know regardless of how the day unfolds I will enjoy myself as that is the most important thing for me. Good luck to all of those running Trail Mix today, it should be a great day for a race. I am a little bit in panic mode too, especially after getting blisters just 3 miles into my run at Afton in the same shoes & socks that I've been wearing for 2 years. Yikes! Oh no, you've started checking the forecast already?? Now I'll probably start checking it too! :) I kinda like all this pre-race jitters stuff. Have a great week... see you there. You'll be fine at Chippewa. I expect everyone to be 1-1.5 hours faster than last year, so a PR is a definite possibility for you. Still considering Eau Claire Marathon??? This blog is designed to capture the concerns, plans and reality of my running adventures. Shoes and race schedule revisited, yes again. The Good, the bad and the ugly?? ?